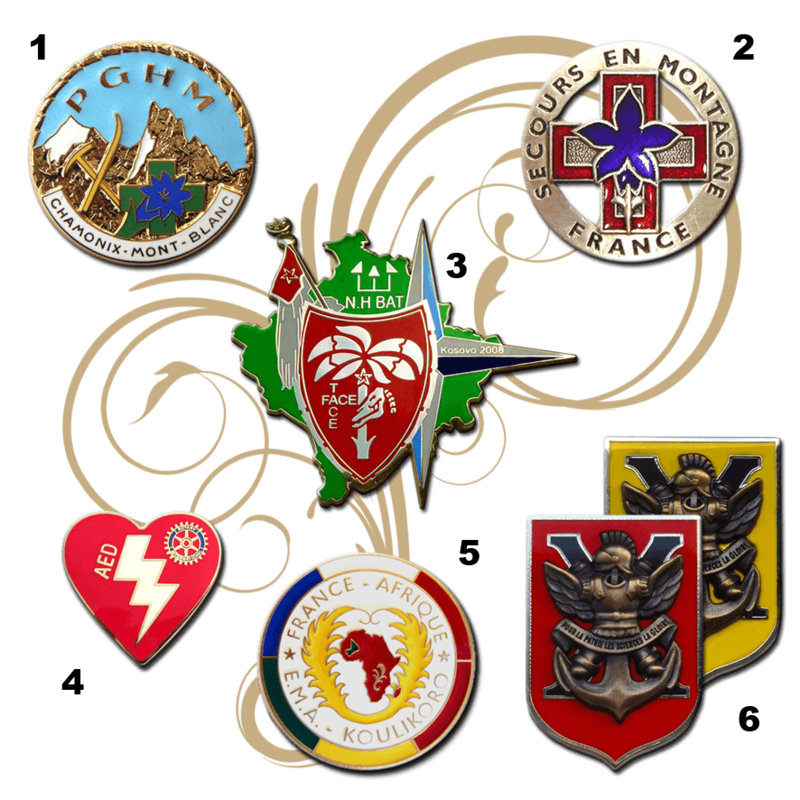 Whether they are custom military insignias or civilian ones, insignias are worn by people who want to display their membership to a group that shares specific values. Hence, it is important for the custom insignia to clearly show the group’s symbol in the most flattering way. Custom insignias can be made with sculptured relief (3D) or with simple relief (2D). 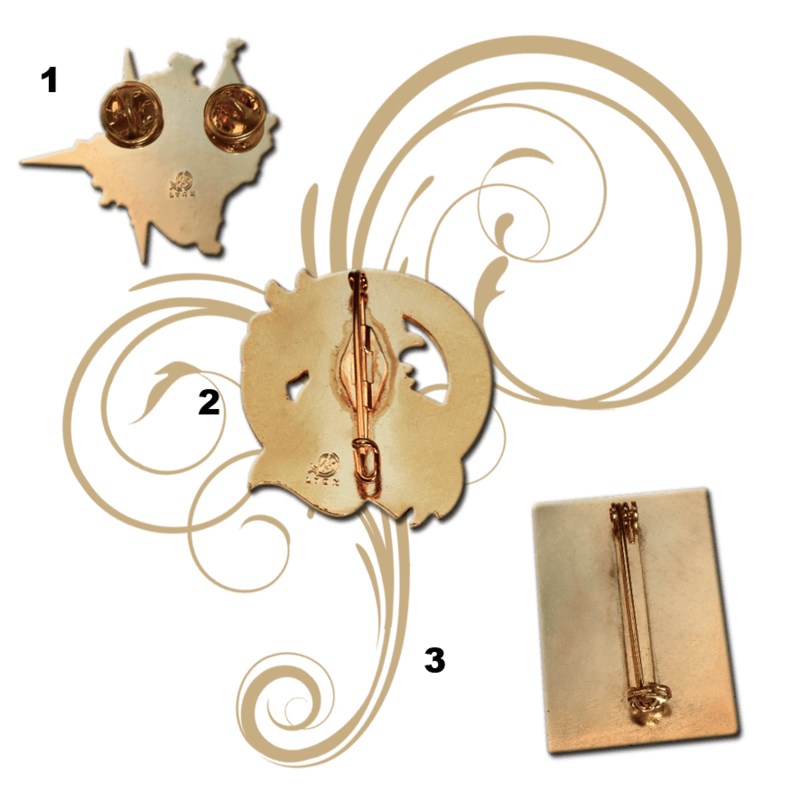 1 - Stamped brass Insignia in 3D Sculptured Relief and gold plating. 2 - Stamped brass Pin in 2D Simple Relief. 3 - Curved pin with silver plating. 4 - Cut out small pin in Simple Relief (2D). 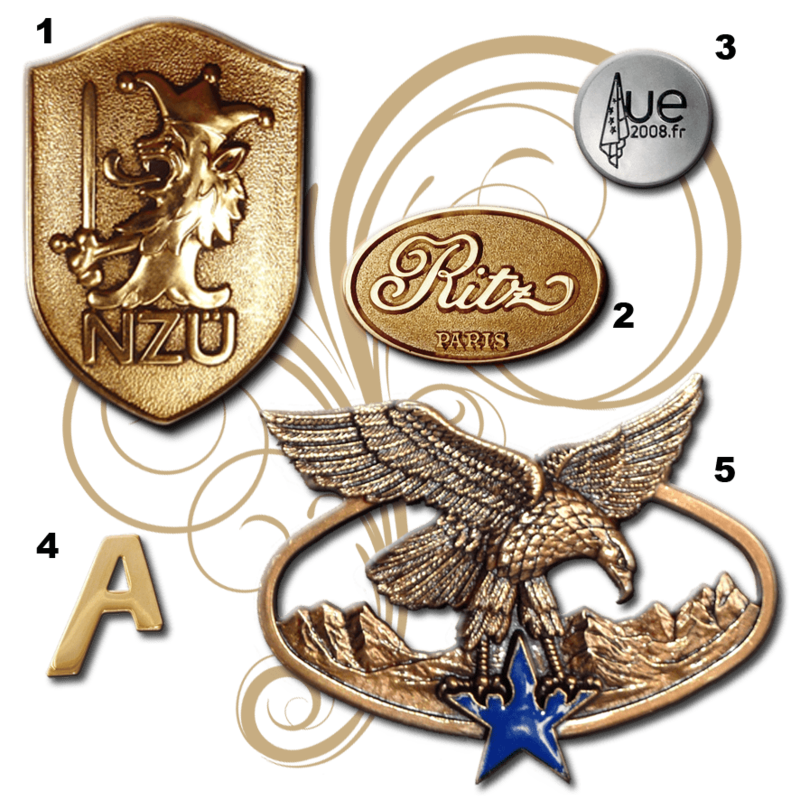 5 - Custom military insignia in Sculptured Relief (3D) with bronze finition. Stamped pins can be made out of brass, silver sterling or gold. 1 - Pin in stamped Brass. 2 - Pin in stamped Silver Sterling. 3 - Pin in stamped Gold. Simple insignias with low relief and many colours can be made on photo-etched brass. 1 - Photo-etched brass insignia with silver plating and epoxy protection. 2 - Photo-etched brass pin with gold plating. 3 - Photo-etched pin with black nickel plating. 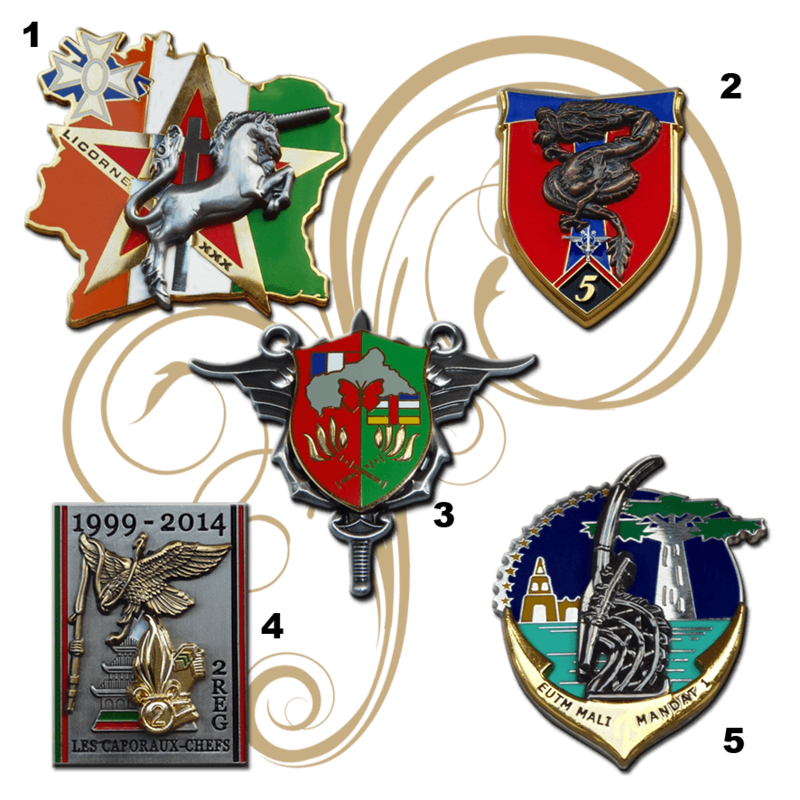 4 - Photo-etched insignia with bronze finition. For works with much relief and a rather complex artwork, insignias can be made in 2 pieces or even more. 1 - Custom military insignia in gold plating with a silver plated additional piece. 2 - Military insignia in gold plating with an additional piece in bronze finition. 3 - Military insignia in silver plating with a gold plated and coloured additional piece. 4 - Silver plated military insignia with 2 additional pieces: bronze and gold. 5 - Silver plated military insignia with 2 additional pieces: black nickel and gold. Beautiful stamped insignias are made with real hard enamel colours which are mineral colours vitrified at 850°C. But synthetic enamel is more frequently used to colour pins and insignias. 1 - Insignia with hard enamel colours. 2 - Insignia with hard enamel translucent colours. 3 - Insignia with emery-grinded synthetic enamel colours. 4 - Pins with emery-grinded synthetic enamel colours. 5 - Insignia with synthetic enamel colours. 6 - The same insignia can be made in different colours. Sometimes, very small details cannot be engraved in the metal of a pin, so they are printed and then covered with a protective layer of epoxy. 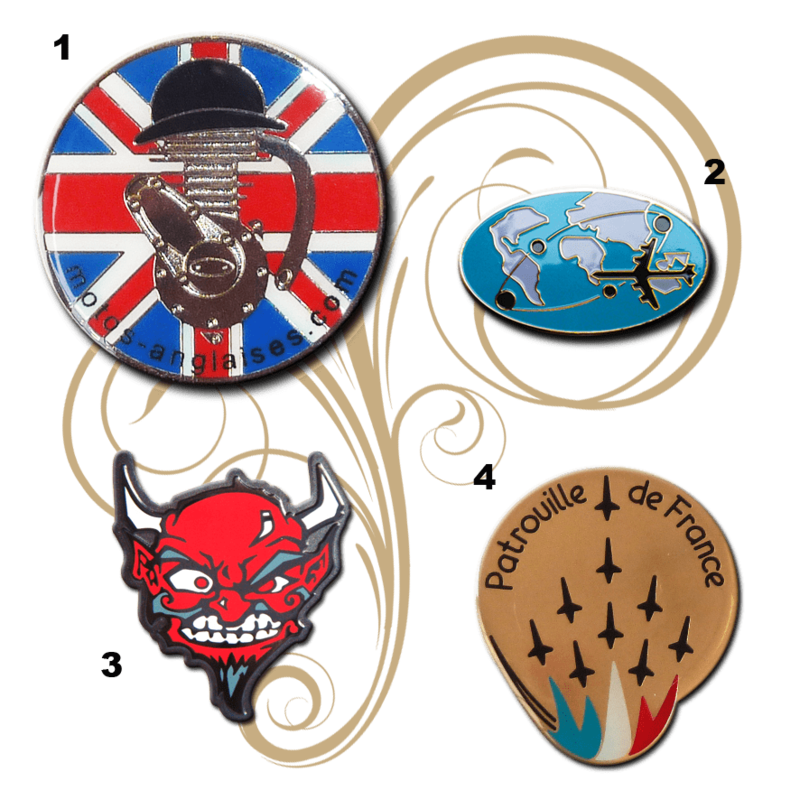 1 - Silver plated pin with printed colours and epoxy protection. 2 - Pin with printed details. 3 - Badge with printed colours. Pins are smaller insignias (between a few millimetres and 30mm – or up to 1.3") with a pin attachment on the back. 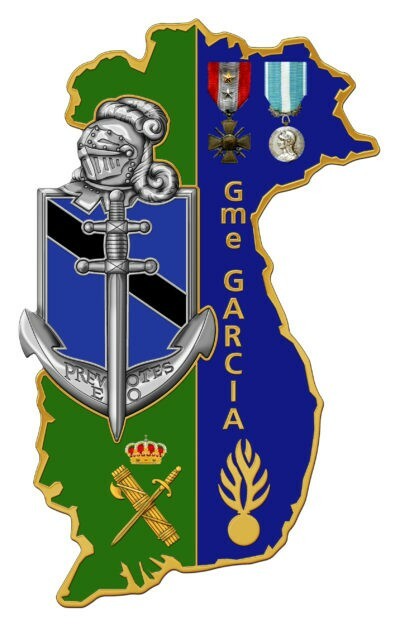 1 - Insignia with two Lapel Pin attachments. 2 - Insignia with a German Pin attachment. 3 - Insignia with a Safety Pin attachment. 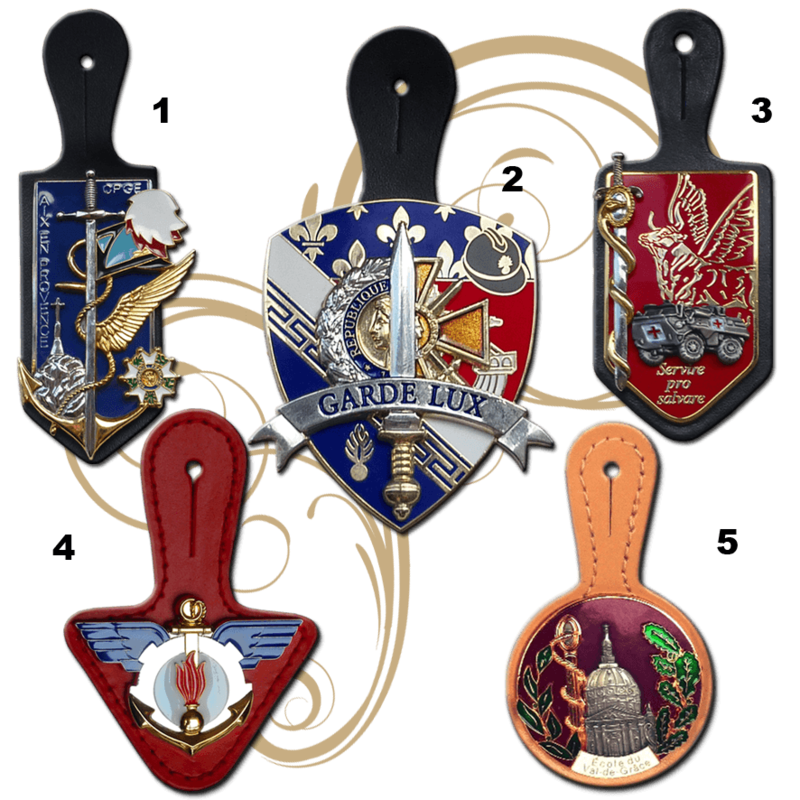 Some custom military insignias are attached to a leather fob. 1 - Two pieces insignia on a black shield leather fob. 2 - Two pieces insignia on a black shield leather fob. 3 - Two pieces insignia on a black shield leather fob. 4 - Insignia on a red triangular leather fob. 5 - Insignia on a round camel leather fob. 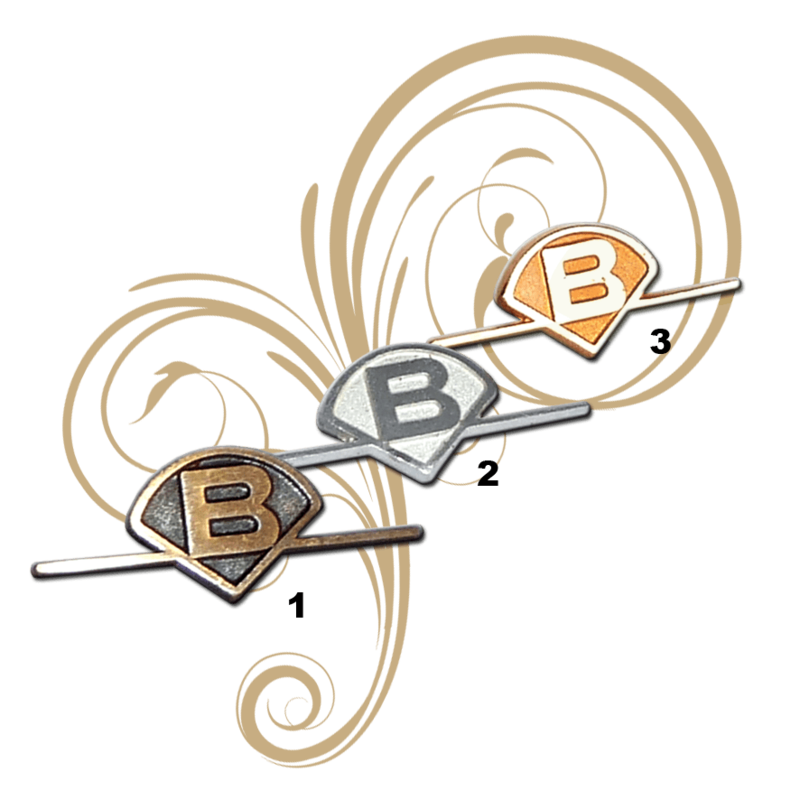 Pins can also be presented on a tie bar or on cufflinks. 1 - Nickel plated Tie Bar in its presentation box. 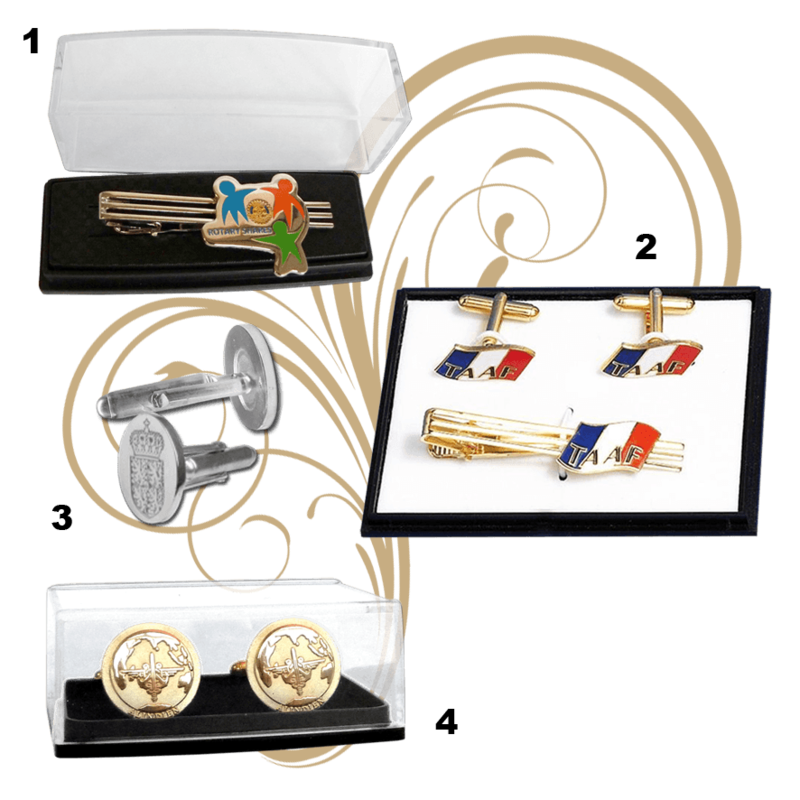 2 - Gold plated Tie Bar and its matching Cufflinks in their presentation box. 3 - Cufflinks stamped in silver sterling. 4 - Gold plated Cufflinks in their presentation box. 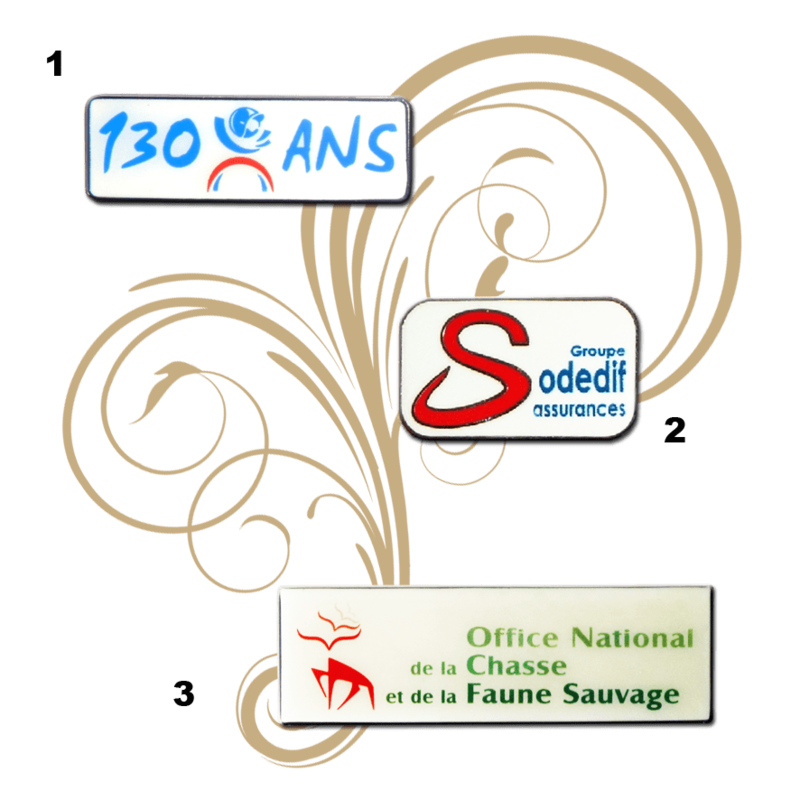 The minimum order for a custom-made creation is 50 pieces to create a custom insignia or a custom pin. 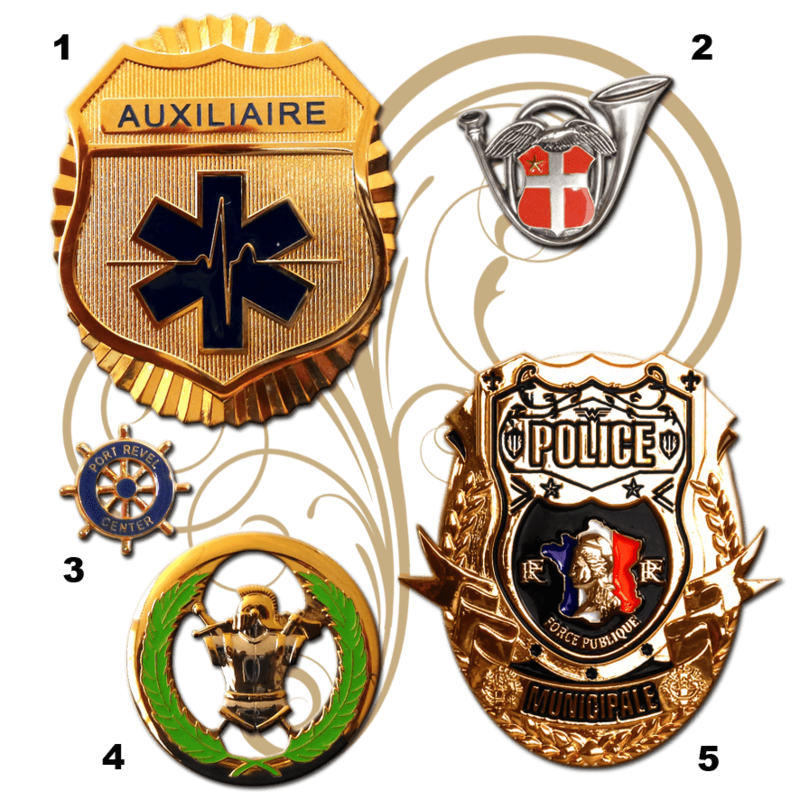 There are many different symbols and values that custom insignas and custom pins have to convey about the people that will wear them. And as far as the custom military insignas are concerned, the complexity is still frequently drastically increased. Different technics such as making the insigna with”additional pieces” – generally one, but up to 2 or 3 additional pieces- can help showing all the components of the full message especially on a custom military insigna. Printing tiny coloured details that cannot be engraved because of their size or printing some specific areas with a colour gradient , is also a technique which gives more degrees of freedom in defining the artwork of the custom insignia or of the custom pins. Presenting the custom military insignas on a leather fob is quite frequent : wether it is a black or a coloured leatherfob , with or without stitching around, is a matter of individual choice. As far as the custom pins are concerned, once the die has been created, they can be presented as a simple pin’s with a butterfly clutch in the back, or as a beautiful tiebar, an elegant pair of cufflinks, or as a set of assorted tiebar and cufflinks.